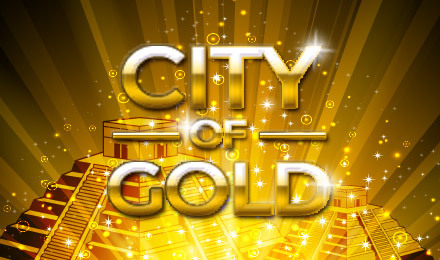 Win 15 FREE Spins when you play City of Gold slots online! This Aztec- themed slot game has 5 reels, 20 paylines and great bonus games! Spin to WIN today! Go on an ancient Aztec adventure and play City of Gold slots! This 5 reel, 20 payline slot takes you on a thrilling journey to collect golden treasures from mystery temples! The Temple symbol is the Wild and will replace other symbols besides for the Scatter for greater winning chances! The Golden Archway is the Scatter symbol and can help you win 15 FREE spins! What even better is that FREE spins wins are tripled so you can expect really BIG payouts! The Free spins can be reactivated as long as you keep winning so you can win loads of jackpot cash! Play NOW!